The 2016 Edition of Michie’s Maryland Court Rules is available! The 2016 Edition of Michie’s Maryland Court Rules is available at the Law Library! The 2016 edition includes amendments adopted through October 20, 2015 and supersedes and replaces all previous editions and supplements. The Maryland Rules are the rules of practice and procedure followed by Maryland courts and apply to all Maryland courts, unless noted otherwise. Michie’s Maryland Rules are annotated, meaning that there are explanatory notes and comments added to the rules by the publisher’s editorial staff. Annotation sources include Maryland case law, the Maryland Law Review, the University of Baltimore Law Review, the University of Baltimore Law Forum and Opinions of the Attorney General. If you are new to the Maryland Rules, the People’s Law Library has an online video tutorial on reading the Maryland Rules through Westlaw, which is available at http://www.screencast.com/t/My0FU44NZbwL. Can I access the rules online? 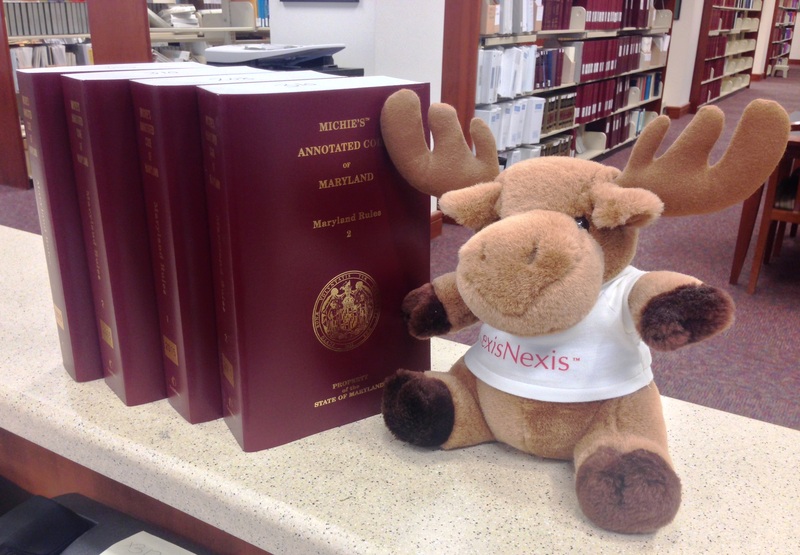 Yes, the current Maryland Code and Rules (without annotations) are available online, free of charge, through LexisNexis and Westlaw. In addition, you can access the Law Library’s online subscriptions to LexisNexis and WestlawNext in-person at the library. What about the superseded Maryland rules? 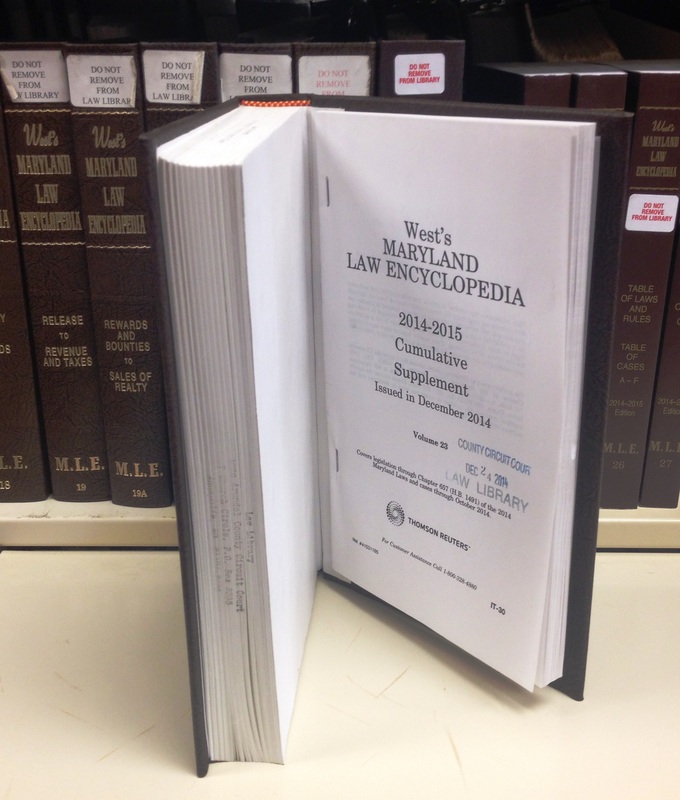 The Law Library maintains copies of the superseded Maryland Rules from 1980 to the present in its collection. 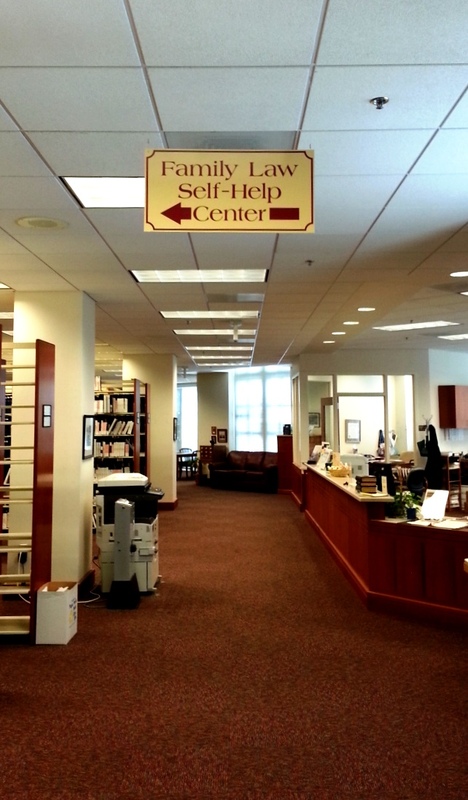 If you need to reference the superseded Maryland Rules, please drop by the Law Library’s service desk, and we can assist you in locating the appropriate resources. January is one of the Law Library’s busiest months for updating resources, including updating pocket parts and filing supplemental pages. As you are conducting your legal research, it is essential that you make sure that your sources, both primary (e.g., code, regulations, case law) and secondary (e.g., treatises, form books) are up-to-date because the “law” is constantly changing. The onus is on the legal researcher to make sure their information is current. Here are a few helpful tips for making sure that your resource is up-to-date. Check the cover or title page to determine the publication date of the resource. The publication date will provide clues as to whether you should check to see if a later edition of the resource has been published. Check the pocket part and take note of the date of the pocket part. Pocket parts are paper supplements that are generally located inside the back cover of a hardbound volume. If you are not sure if the pocket part is current, please drop by the service desk. The Law Library keeps track of its updates, and we can let you know if the pocket part is the most recent supplement available. Check for any standalone supplements to the resource. When in doubt, ask us at the Law Library’s service desk, and we can confirm whether a volume has a standalone supplement. Online does not necessarily mean current. Is the information posted on a reputable site? Check for a publication date or “last updated” date. When in doubt, ask! Here are some great resources that provide an overview of the basics of legal research. In addition, the following titles, which focus on providing a comprehensive overview of the legal research process and fundamentals, are available at the Law Library. The 2015 Edition of Michie’s Maryland Court Rules is available! The 2015 Edition of Michie’s Maryland Court Rules is available at the Law Library! The 2015 edition includes amendments adopted through November 7, 2014. The Maryland Rules are the rules of practice and procedure followed by Maryland courts and apply to all Maryland courts unless noted otherwise. Annotation sources include Maryland case law, the Maryland Law Review, the University of Baltimore Law Review, the University of Baltimore Law Forum and Opinions of the Attorney General. The current Maryland Code and Rules (without annotations) are available online, free of charge, through Lexis Nexis and Westlaw. In addition, you can access the annotated Maryland Code and Rules online in the Law Library’s computer room through the Law Library’s subscriptions to Lexis and Westlaw legal databases. If you are new to the Maryland Rules, the People’s Law Library has an online video tutorial on reading the Maryland Rules through Westlaw, which is available at http://www.screencast.com/t/My0FU44NZbwL. The 2015 edition supersedes and replaces all previous editions and supplements. 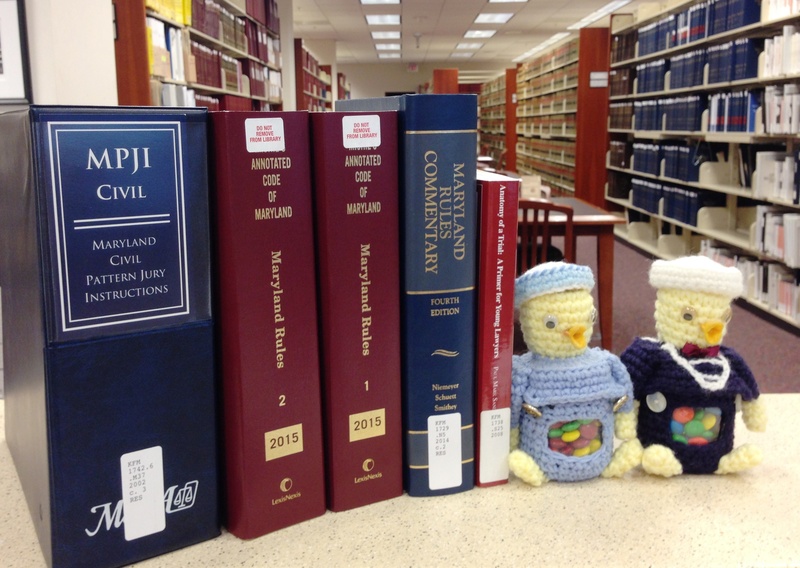 Note that the Law Library maintains copies of the superseded Maryland Rules in its collection, so if you ever need to reference the superseded rules, please drop by the Law Library’s service desk, and we can assist you in locating the appropriate rules. Issue 02, Spring, 2013 of Moving Justice Forward, the quarterly bulletin that provides information on the implementation of Maryland Electronic Courts (MDEC), reports that the rules order concerning e-filing was posted on May 2, 2013 on the Judiciary website. The 176th Report and Supplement Rules Order, filed May 1, will go into effect July 1, 2013. The report included changes to existing rules because of e-filing and the new Title 20, Electronic Filing and Case Management. The new rule 20-102 states that the new Title 20 will apply only where MDEC has been established and will start with Anne Arundel County. Issues covered include how attorneys will register, a new definition of what a “day” is, signatures, procedures for self-represented litigants and access to records. The article that begins on page 9 provides a good overview of the new Title 20. In the last few years we have seen many rules changes especially with those rules adopted in response to the foreclosure crisis. The adoption of new rules has on occasion caused the printed volumes and even the online versions to become outdated. How do you know if you are looking at the most current rules? The easiest way is to check the webpage of the Standing Committee on Rules of Practice and Procedure for proposed rules and recent rules orders and compare the information with the currency date of the rules you are using. LexisNexis publishes the Advance Court Rules Service to update the bound annual volumes and supplement. A number of pamphlets are published throughout the year to update the annual volumes and the supplements. Proposed rules are also included. However, being a printed source it may not be received in time. For example, Pamphlet #6 of 2011 was received on December 1, 2011 but contained rules that were effective November 1, 2011. There are online sources for the rules as well. Lexis provides free, unannotated rules at www.michie.com. The Maryland Rules are also a database on the paid, password required, www.lexis.com. Still, it is important that you note when they were last updated for either source and compare that date with the most recent the date of the most recent Rules Order. Each of the online Lexis provided rules have a statement at the beginning of the rule stating that the rules are current through a particular date. You can also see the history of that rule by scrolling down to the end of the rule to find the history information in parenthesis. With Lexis.com there is also the option of clicking on the information icon next to the database for currency information. Lexis.com also has a rules orders database containing databases for all states. Each state has a number of years that can be selected. The list provided within the year is not organized for easy determination of the date of the most recent rules report. The official Rules Committee would be your best choice as there is a disclaimer\notice with the Lexis.com Rules Orders database that states: “Though LexisNexis seeks complete coverage of orders that serve to update rules of court, customers are advised to contact court clerks for the text of applicable rules.” It would be best to check the Rules Committee webpage rather than ask the Clerk of the Court. Maryland Rules are found on Westlaw in the Maryland Court Rules database. The currency of the database can be found in the database scope information and is also found at the end of each rule with the history. Westlaw also has a Maryland Rules Update Orders database containing only those rules orders that came after the currency date of the Court Rules database. The orders are not dated and are in a list in order by West’s own numbering system. Like the Lexis.com database it is not easy to determine what the dates are. You can keep track of Maryland Rules changes by visiting the Rules Committee webpage and making sure that whatever source of the Maryland Rules you are using reflects the changes in the most recent Rules Order. If it does not, you can easily check the order to see it the rule you are relying upon has changed. The Law Library monitors the Rules Committee webpage and prints the Rules Orders to be kept in the “Rules Orders” binder. The binder is shelved with the Maryland Rules.